Wonderfully clever and yet beautifully simple, the Crosswater Digital shower valve gives you complete control over your water flow. 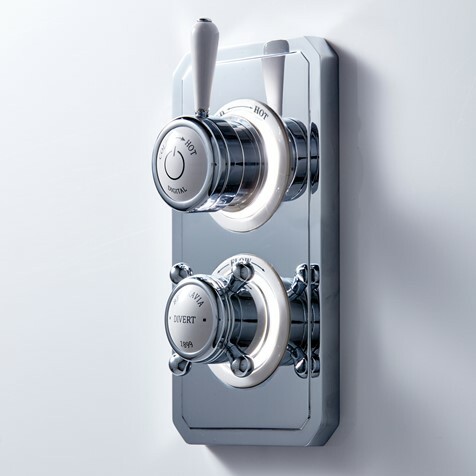 The premium control features of the Crosswater Digital shower make it simpler, more innovative, and safer to use than conventional shower valves. 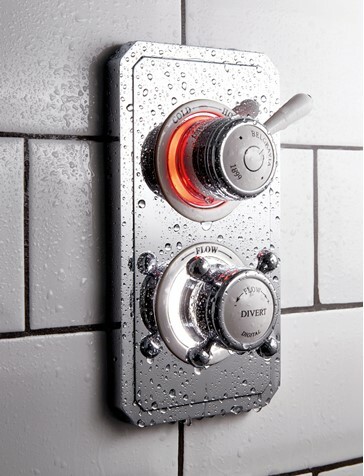 Turn on the water by gently pressing the control dial, and watch the controls flash white as the shower heats up. When the controls stop flashing and begin to glow, the water’s just how you like it – so step in and enjoy. The dual outlet processor controls one shower head and one bath filler. Press the lower handle once to divert from the main outlet to the second shower head, and a second time to run both at once. No need to worry about fluctuating temperatures or surges of hot or cold water. Our Digital shower closely monitors the temperature to ensure it stays exactly as set – even if someone is using water elsewhere in the house. If you adjust the temperature, the unique colourchanging controls will flash red as the water heats up, then blue while it is cooling down. Once it reaches your desired temperature the controls glow white to let you know it’s ready. And if there is a problem with your water or power supply, the flow will shut off completely.